Hisense H43AE6100UK 4K Smart TV review | What Hi-Fi? How low? For just £329, Hisense will sell you a 43in screen with an edge LED backlight and support for 4K and HDR. The HDR is actually something of a busted flush, but the H43AE6100UK is in many ways quite the bargain. In design terms, there’s no mistaking the Hisense’s budget status. This is a lightweight and plasticky television with a glossy black finish that borders on the tacky. On the plus side, that lightness will make wall-mounting a doddle, and once the lights have been dimmed you’re not going to be bothered by the low-rent materials. The remote looks rather basic, too, but thanks to a relatively ergonomic design and buttons that are pleasantly tactile and clicky, it’s far better than it appears. Around the back of the set you’ll find three HDMI inputs (two support 4K at 60Hz and the third at 30Hz), two USB sockets, an optical output, and aerial and satellite connections. You’re unlikely to get much mileage from that satellite connection as the set doesn’t support Freesat, but those who get their TV via aerial will be pleased to discover that Freeview Play is on board, making it quick and easy to access catch-up content from all of the UK’s terrestrial channels. Hisense takes the liberty of pre-installing most apps so that they’re more or less ready to go when you are, and the selection is surprisingly decent. On top of those catch-up apps you get Netflix and Amazon, both in 4K and HDR, as well as Rakuten for pay-as-you-go movies. Now TV would be nice, of course, but for a budget set we’re happy with what’s on offer. The TV’s menus are Hisense’s own, and they’re exceptionally basic. That does make them easy to navigate, though, particularly when you factor in the set’s general responsiveness. HDR should show off the TV at its very best, but that’s not the case here. In fact, HDR is where the H43AE6100UK is at its very worst. The default HDR Day mode is flat, washed-out and completely lacking in contrast, and though HDR Dynamic is the best of the three picture presets available, it still requires some extensive tweaking to get to what we feel is the best HDR performance this Hisense is capable of. That isn’t saying a great deal, though. The big issue is the backlight, which seems determined to shine its brightest regardless of the impact to the rest of the picture. Overall contrast is, unsurprisingly, lacking. Blacks simply aren’t black and on top of that whites aren’t properly white. This simply isn’t HDR as it should be. It’s not all bad, though. Colours are decent – vibrant within the set’s brightness limits but also natural and relatively nuanced. There’s reasonable detail and sharpness, too, and while there’s no motion processing setting as such, movement is no more juddery or blurry than that from many more expensive televisions. These qualities are retained when you move to 4K and 1080p content in standard dynamic range, and when the backlight isn’t working overdrive with an HDR signal, it’s a far more satisfying performer. This still isn’t what you’d call a punchy performance, but the image is naturally balanced, sharp and detailed. Drop down to standard-def and the Hisense is closer still to its more expensive rivals. Escape To The Country via the integrated tuner appears with nicely judged colours and admirably little noise, with the relative softness of the image being a more than reasonable trade-off. If the Hisense’s picture quality is surprisingly decent, its sound quality is predictably poor. This is a tinny and thin delivery, to the point of irritation. The audio is relatively indirect, too, so it sounds as if everything is happening around the back of the TV. That said, voices emerge relatively clearly, so for everyday, unchallenging viewing, it will suffice. In other words, it’s adequate for Escape To The Country, but will do a poor job with Escape From New York. Products don’t get a pass from us by simply being cheap. £300 spent on something rubbish is still money wasted. But the Hisense H43AE6100UK isn’t rubbish – nor is it a waste of money. The HDR performance is poor at best, and that’s a shame, but it’s not really what you buy a budget 43in TV for. The Hisense handles the bread and butter of everyday watching impressively for the super-low price. 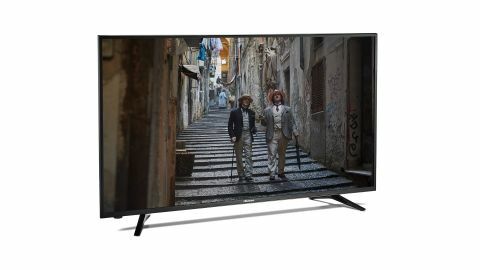 If you want a proper HDR performance, Philips will sell you a 50in 50PUS6272 TV for a little under £500, but for some people that’s simply too big and/or too expensive. As long as those people don’t expect the moon on a stick, they should be more than happy with the H43AE6100UK’s performance. Should you buy a Hisense 4K TV on Black Friday?